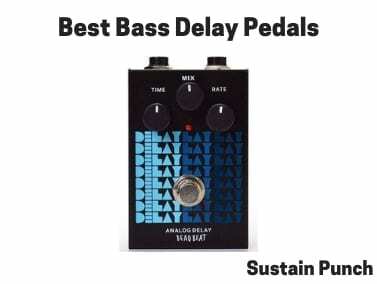 In this article, we’re going to be talking about the top 12 Bass Delay Pedals. However, before we get into that, let’s first talk about what exactly a bass delay pedal is, how it works and how it differs from, let’s say a bass reverb pedal for instance. So without further ado, let’s talk bass delay processing pedals. What is a Bass Delay Pedal? Analog or Digital Bass Delay Unit? Which is better? Conclusion – Which is the best delay pedal for Bass? Simply put, a Bass Delay Pedal will take the input bass signal and repeat the processing of this signal, so that it is audibly repeated based on a number of different settings on the interface. This includes the length of the delay time, with some modern units providing up to 7 seconds of delay time, alongside feedback time and tempo requirements. A bass delay unit differs from a bass reverb unit due to the time increment in which the original signal is repeated, if it’s below 100ms it’s perceived as a reverberation, as the ear cannot differentiate the two signals based on this small timeframe. Traditionally, in the early days of rock and roll, tape delay machines were heavily used to help achieve this effect, with the likes of famous musicians such as Buddy Holly and Elvis using it in their recordings. Towards the 80’s, analog delay pedals were used, with the likes of the famous Boss DM-1 Delay pedal being launched in 1978 and the Boss DM-2 model being launched in 1981. The key difference between these units was the fact that Boss introduced Bucket Brigade Circuitry in the DM-2, as opposed to Charged-Couple technology. Little did they know that the Bucket Brigade Technology is still used even today, with companies like MXR swearing by it’s superior warm sound quality, and example being in the MXR M169 Carbon Copy. 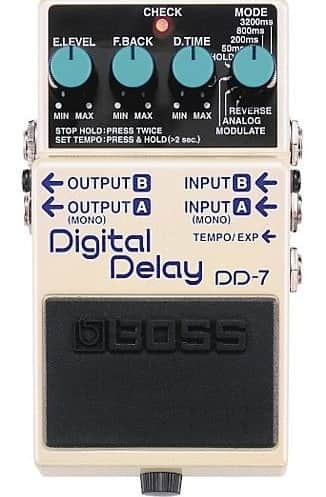 Nowadays, digital technology (DSP) has become more readily utilized for many bass guitar effects, and some companies such as Boss have been leading the way on this front, with some great examples of pedals which use this being, the Boss DD-3 up to the current DD-7 issue. They use Digital Signal Processing (DSP) chips, which are able to produce versatile delay effects, long or short with added tonal effects. The inputted analog signal is converted to a digital signal using high-quality converters, offering a 24-bit resolution. Therefore, it’s a question as to which advantages apply to the way in which I play as a bassist, and the sound that I want to achieve. Based on this, you’ll be able to make a good decision on the technology that you want to use. Before we get going into the top delay pedals for bass, it’s important to realise that a delay pedal can muddy up your bass signal, therefore having a logical signal path is crucial, with compression/equalization and other polishing processers towards the end of the signal chain. And as always in our reviews, we’ve arranged the list based on price, from least expensive to most expensive. Whilst commenting on all aspects of each pedal, including technical information and product features. Well, without further ado, let’s discuss what the best bass delay pedals are in 2019. Repeat Rate: Adjusts delay time (repetition rate). The Behringer Vintage Delay pedal is a low-cost, delay pedal for Bass & Guitar, which offers a decent quality delay effect. 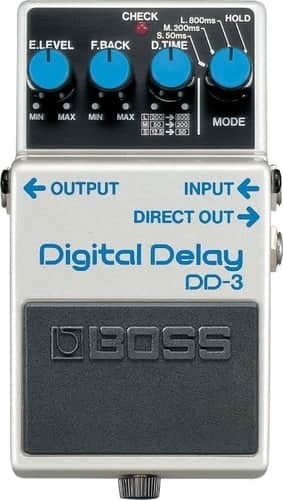 Similar to most Behringer products, the vintage delay is modelled on the Boss DD-3 pedal and thus takes inspiration from its design. Although the Vintage delay pedal is not as well constructed as the Boss pedals, it still provides solid protection. The interface of the Behringer unit is simple, and easy to use, with it having three knobs to control the output delay sound, these include: Repeat Rate, Echo & Intensity. For the most part, these controls will be all that a bassist needs to get a basic delay effect; Although considering the price-point, it’s great! Other than the basic functions, the real setback of this pedal comes in it’s delay time ability, with it only being able to handle 300ms of delay, which when compared to other more expensive units (Boss DD-7: 600ms, MXR M292: 1200ms), it may not be ideal for some. However, we have to remember that this pedal is less than $30, and therefore, for the price, it’s a wonderful solution, and truly amazing that they can provide a delay pedal so inexpensively. As for how this pedal sounds, well as you can expect, it won’t blow your socks off, but it will do the job. Being a vintage delay pedal, it will add some more fuzz to your sound, which for some may not be what they’re after. For the bassist who wants a very cheap bass delay pedal for jamming and playing small shows; It’s fantastic for that! The EX AD-6 processor is a highly compact and incredibly durable delay pedal for bass. The metal casing makes it ideal for the musician looking to gig with it, and for the price, it’s certainly not an expensive unit. The pedal’s interface is fairly easy to use, with 4 main knobs controlling the delay parameters; These include Level, Mix, Repeat and Time controls. The pedal can deliver a fairly small delay range from 30ms-340ms, which is expected considering its price and the fact it’s an analog pedal. Unlike other pedals within this price-range such as the Donner Echo Square, this unit does not offer any modulation or additional delay effects. Although this is slightly disappointing, it’s expected considering the price. As for the sound of this unit, it certainly provides a good-quality output signal. For the bassist looking for an inexpensive, durable processor. Although we’d have trouble recommending this over other alternatives such as the Donner Echo Square unit, which provides decent sound quality and additional modulation effects. 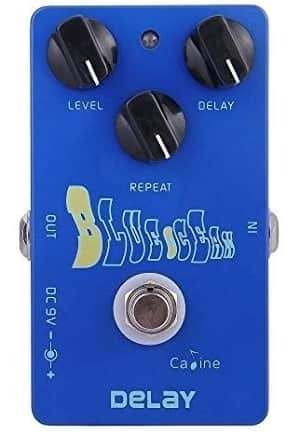 The Caline Blue Ocean is another pedal we’ve featured on our list of top bass delay pedals, and that’s for a number of reasons, not just for the decent sound quality. Firstly, the unit itself is priced at $35, making it a very affordable option for most people. It’s housed in a sturdy metal case meaning that you shouldn’t be worried about it taking a few knocks. As for the interface, it’s extremely straightforward to use, having 3 knobs which control the delay functionality. Therefore if you’re looking for a pedal with minimal gimics, this one is ideal. As for the sound quality of this unit, the delays on this unit sound very nice, clean with clarity on the high frequencies, and a little warmer and fuzzier on the low-end. For the bassist who’s after a simple to use, highly affordable and great sounding delay pedal. We were extremely impressed with the quality of the delay considering the price. 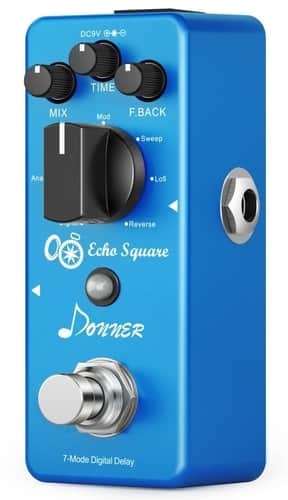 The Donner Echo Square delay pedal for Bass & Guitar is a small, lightweight unit, protected by an all-aluminium shell. It provides up to 7 different delay tones to suit your needs, these include Digital, Analog, Modulated, Sweep, Low-Filter and Reverse. Once you’ve picked a delay tone, you can then modify the overall signal by using the 3 knobs, helping adjust the blend of the dry and wet signal (Mix), the delay time (Time) and the repetition rate (F.Back). The pedal is able to provide delay times ranging from 20ms all the way to 838ms, so it’s got you covered! This unit is priced at just under $50, making it extremely affordable; Considering all of the functionality, it’s very impressive. We were surprised to find that it sounds great, and maintains a good level of clarity. Although, despite this pedal providing True Bypass, we recommend using an EQ pedal to regain some of the low-end that could potentially be lost, as it’s difficult to recommend as we’re not sure of your exact setup. For the bassist who wants plenty of functionality, without spending too much. Would be ideal to gig with considering the durable casing and the size. The Delay Lay Lay analog pedal by Dead Beat electronics is certainly an eye-catching piece of kit. This pedal is suitable for Bass and Guitar, and offers a small/mid-range amount of delay (from 140ms – 360ms), perfect if you’re looking for an ultra high-quality subtle delay. Although, make no mistake that this pedal can create round-house repeating delay oscillations if you’re trying to create an ambient sounding bass part. As for the pedal itself, it looks extremely attractive and has a simple to use interface with three control knobs, Time, Mix and Rate. So other than the stunning visuals, how does this sound? Well, to describe it in one word ‘Refreshing’. The pedal provides a really nice delay sound, offering plenty of clarity and a dreamy quality on the upper-end. As for the lower-end frequencies, being an analog pedal it adds a minute amount of warm fuzz, which we really like. Taking into account the price, the aesthetics and sound quality, it’s one of our favourites! For the bassist looking for ease of use, stunning sound quality and pristine aesthetic design, all for an unbelievable price. Oh, and they provide a nice case to package it up in. Win, win! The Delay pedal by CNZ audio is a small, durable analog processor with aluminium casing, suitable for placement on almost any bassist’s pedalboard due to its size. It has three control knobs to customize the delay settings, this includes the length of the delay echos, the speed of the delay and the volume of the delay feedback. It is important to note that they don’t actually state the minimum and maximum delay times on their website or on Amazon. The unit is priced around the $50 mark, making it an affordable option. Although with incredible alternatives like the Delay Lay Lay analog pedal by Dead Beat electronics, we can’t help but think it makes this option redundant. 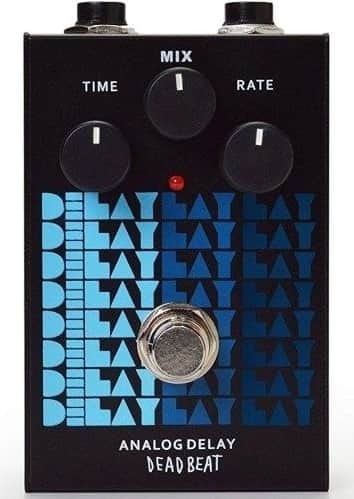 Although we think this is a great pedal for those who require a very small delay pedal, considering the price, we think the Delay Lay Lay by Dead Beat Electronics provides just as much, if not more! Both from a quality/audible standpoint and a visual one. However, it’s important that you take a listen to the video demonstrations before making up your mind. If you’re looking for up to 1200ms of delay, check out the MXR M292, which has more control parameters and an expression pedal jack input. 9v battery (included): 9v AC adaptor is included in the ‘Accessories Bundle’. The Boss DD-3 was the Flagship delay pedal model for many years, and for a lot of musicians even to this day, it still is! This is for a number of reasons, including the fact that it’s built to last and provides a high-quality sound; But what’s so different about this DD-3 when comparing it directly with the DD-7… Let’s discuss that! Upon comparing the two pedals (DD-3 & DD-7) it’s clear that the DD-7 has more mode features, with the DD-3 not having ‘Reverse’, ‘Analog’ or ‘Modulate’, additionally the DD-3 has less time mode increments available, with 3 options as opposed to the DD-7’s 4 options. The DD-3 also doesn’t have Dual input, but has dual output and doesn’t have the expression pedal/footswitch input jack that the DD-7 has. So if the Boss DD-3 clearly has fewer features than the newer DD-7 pedal, why is it that people still rave on about the DD-3, and that’s simple to answer…. The warm tone. See the Boss DD-3 has a noticeably warmer tone than the DD-7 due to slightly different internal circuitry, and thus for the bassist/musician who prioritizes tone over other features, the DD-3 is the winner. Other than this, the Boss DD-3 and DD-7 are similar, being run on a 9v internal battery, although for long jamming sessions & gigs, it’s recommended that you plug this fella into a 9v power supply (we’ve linked to an appropriate 9v power supply above). Considering the price, you’re getting a fantastic delay pedal, with the tone of an angel! For the bassist who wants a pedal that will provide bass delay tones that will even make the guitarist (yeah that ego-maniac) turn his head and nod. If you’re looking for up to 1200ms of delay, check out the bigger brother [MXR M292], which has more control parameters and an expression pedal jack input. The Carbon Copy Analog pedal, built by MXR/Jim Dunlop is their version of what a delay pedal should sound like. MXR really set the gold standard of what a delay pedal for bass & guitar should sound. This unit is built using 100% analog (bucket brigade technology) circuitry and you can really hear this by the way it sounds, having a nice warmth to the signal character. You can rest assured that when disengaged, the signal is running through with minimal interference, with this device providing True Bypass. It provides a few interface options to control the length, repeat count and mix of the delay signal, and can provide delays of 600ms (maximum). If you would prefer longer delay times, alongside more interface options, we recommend looking at the MXR M292 unit, which is the bigger brother in the analog delay pedal range. The M292 can deliver up to 1200ms of delay, with more interface delay parameters to make customizations to; It also has an added jack input for you to connect an expression pedal if you so desire. So how does this unit sound? Well, being an analog pedal, you can definitely hear the warmth of the delay signal, and it sounds pleasant to the ear. However, as with all of the pedals we’re recommending, once the signal has been processed in this unit, we recommend sending the signal to an EQ to sharpen the sound, as delay can muddy the water so to speak. As for the downsides of this unit, there simply aren’t many! A potential limitation could be the maximum delay time (600ms), but as we’ve previously noted, the MXR M292 unit will provide double the delay time (1200ms). At around $150, all we can say is, the MXR Carbon Copy Analog pedal is awesome! Please note: We recommend the MXR Carbon copy over the Carbon Copy Bright, as it will help retain those low/sub-bass frequencies better. Also, it means that you have the option to brighten the signal up later in the signal path using an EQ pedal, once all processing is done, so you have full control of the parameters. The Boss DD-7 sets the gold standard on bass delay pedal creation for manufacturers across the board. The DD-7 processor not only provides a high-quality sonic performance with its internal analog circuitry, but it also has a range of additional features that other pedals on the list don’t have. These include offering 40 seconds of loop play (using the Hold mode), including multiple delay modes such as Modulate (a delay with added chorus), Analog (a delay which emulates the classic DM-2 analog pedal) and Reverse (the delay is provided with a reversed tape effect) – Refer to the video demonstration below to hear this. The pedal is extremely compact and extremely durable, as most Boss pedals are, and because of this, it’s perfect for gigging because a few knocks aren’t going to hurt this little pedal. Despite the compact size, Boss has featured two stereo modes for signal input and output, giving you more freedom to get exactly what you want from this pedal. They’ve even added a jack input for connecting an optional footswitch or expression pedal; Something you didn’t get in the DD-3. You can run this pedal on the 9v internal battery, although for long jamming sessions & gigs, it’s recommended that you plug this fella into a 9v power supply (we’ve linked to an appropriate 9v power supply above). For the price, considering you’re getting a fantastic delay pedal, with plenty of modulation and even a looper, it doesn’t get much better than that! So how does this unit sound? Well, again this pedal utilizes analog circuitry, giving it a warm sounding delay. The processor really stands out in its ability to provides some unique delay sounds, especially when you’re on some of the modulation settings (Reverse, Analog, Modulate)… All in all, we think it’s a great choice. However, as you’ll see below in the Boss DD-3 review, the DD-3 pedal sounds fuller and warmer in tone; Which some may prefer. For the bassist who wants a pedal built like a tank, which is able to provide a range of delay sounds (with modulation), looping and stereo input/output. Same Electronics as the MXR Carbon Copy pedal, just quirky outer design. The MXR ILD169 is essentially a Carbon Copy Analog processor that has been put in a super-cool, funky outer shell. 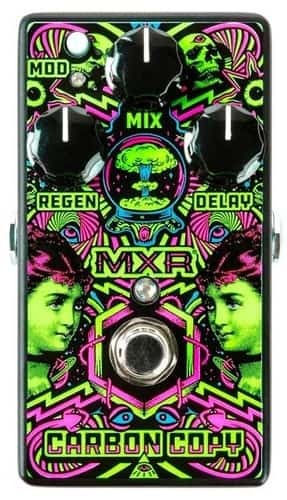 This Limited Edition pedal Built by MXR/Jim Dunlop is their version of what a delay pedal should sound like. 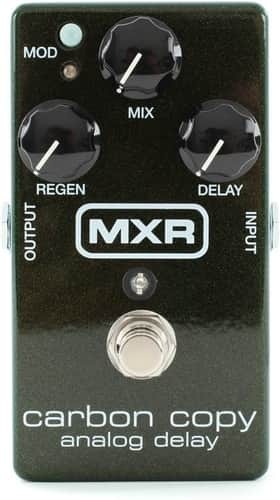 MXR really set the gold standard of what a delay pedal for bass & guitar should sound. 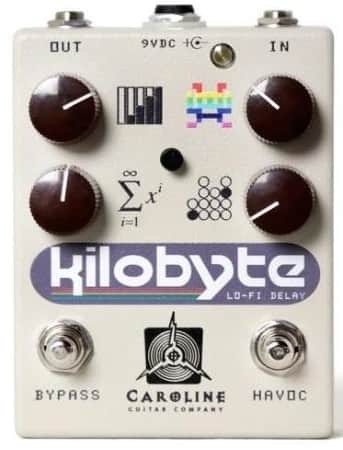 The Kilobyte Lo-Fi delay pedal is a digital pedal that does well at providing a nice analog sounding delay. Not only is this capable of producing high-quality delays, but it can also provide detailed oscillations, filtering and tonal controls. The array of interface controls means that you’ll have fun creating anything from clean slapbacks to muted repeats and dirty echos. The modulation circuitry is a development of the company Jack Deville LLC, who specializes in creating audio-related circuitry. The pedal is aimed more towards the premium-pricepoint, and because of the sheer amount of controls and the quality of the sounds that can be achieved, it’s no wonder why they’re pricing it at this amount. As for how this processor sounds, it does sound extremely nice, maintaining a level of clarity in the delay sounds, even alongside the modulations. For the bassist who’s after a premium-priced, boutique, vintage-like bass delay processor. Although we think this is a great choice, we think that most bassists who are willing to pay this amount would do better with such pedals as the MXR M169 Carbon Copy or the Boss DD-7/DD-3. 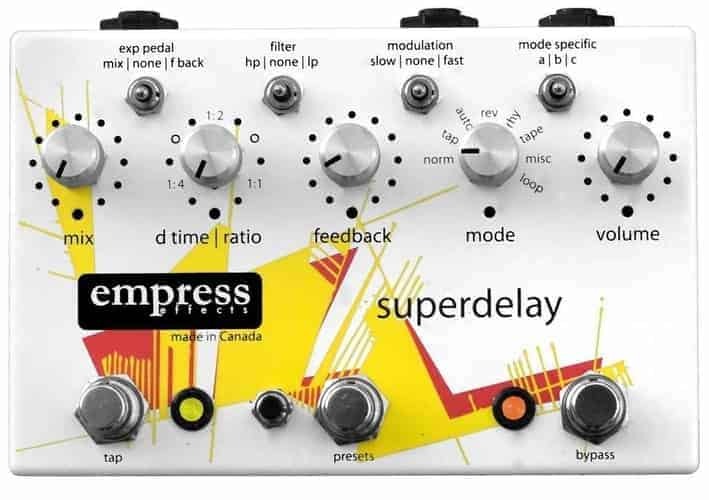 The Superdelay pedal by Empress Effects is a premium processor. Being priced at just below $400, it’s certainly for the select few bassists/musicians to afford. But we wanted to feature it on our list to accommodate for the few who are looking to spend this amount of money. One of the main selling points of this pedal, is the sheer amount of customization settings that are available; From the use of filtering, tap tempo modes, mixing options and modulation settings, it’s clear that you’ll have a blast finding the perfect settings to achieve your sound. Presets can be saved and accessed via the three interface footswitches, making it easier if you’re looking to quickly change between multiple presets during 1 song. Overall, despite the price of this unit, it really does provide an endless amount of opportunities to excite your creativity. For the musician/bassist without a budget, or at least a budget higher than $400, who wants a processor that will satisfy a yearning for ultimate customization. If you’re familiar with the way in which we recommend products, our single aim is to help you (personally) find the ideal processor for you, no matter your budget or requirements… This is why we like to make multiple recommendations based on these different criteria. For the bassist with a decent budget, who’s looking for a well-built pedal from a reputable brand which won’t let them down, providing around 600ms (Maximum) of delay… take your pick from the MXR M169 ($$$ – Mid-Range Priced), Boss DD-3 ($$$ – Mid-Range Priced) & Boss DD-7 ($$$ – Mid-Range Priced). For the bassist with a decent budget, who’s looking for a well-built pedal from a reputable brand which won’t let them down, providing a larger limit of 1200ms(Maximum) of delay… take a look at the MXR M169’s older brother, the MXR M292 ($$$ – Mid-Range Priced). For the money-savvy bassist, looking for a mix of high quality, incredibly aesthetics and lovely tones (can you tell this is our favourite)… Take a look at the Delay Lay Lay Analog pedal ($$ – Moderately Priced) , it’s AWESOME! 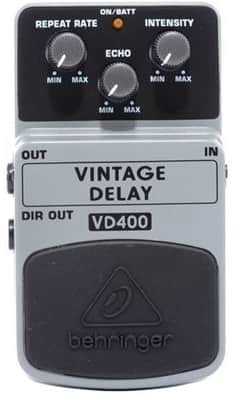 For the bassist with a lower budget, looking for a nice sounding pedal for jamming and the occasional gig… The Behringer Vintage Delay VD400 ($ – Budget Priced) is most likely for you!